The motivational targets widget is great for helping you to stay focused on the numbers that will grow your business. 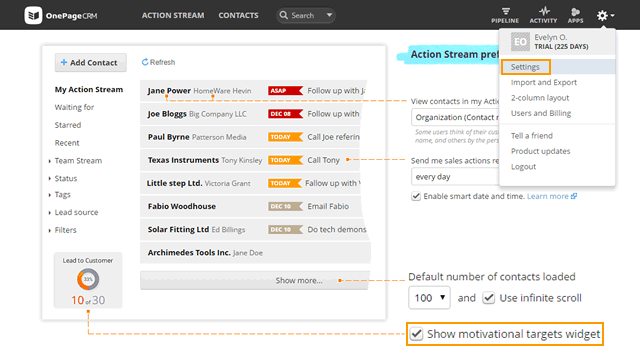 Go to the gear icon → Settings under Preferences, select the check-box Show motivational targets widget. In your Action Stream, hover your mouse over the widget and click on the gear icon. Select the target you wish to update e.g. Conversions → enter the number you wish to convert and the frequency from the drop-down. 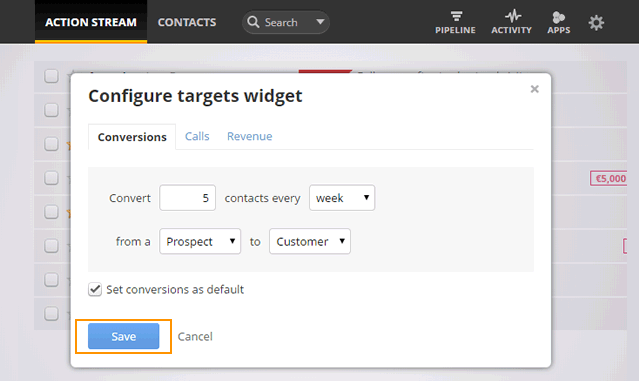 To make conversions your primary target, select the check-box Set conversions as default. Click Save to set this target. Conversions are defined by changing from one Status to another - you can set these requirements as you please. Calls targets can be based on the number of calls per day, week, month, quarter or year. The Revenue value is taken from the Expected total section of your Pipeline page and calculated by month, quarter or year. To minimize the targets widget, hover your mouse over and click on the minimize icon to the right of the gear icon.